This turned out to be an extremely action packed day and I have to admit that I was caught off guard. A convective outlook had been issued for Monday August 11th by Tony Gilbert for the entire country of Ireland with western most areas in prime position for sharper convection. This forecast was backed up by ESTOFEX, Met Office, and RTE. So all was looking good with a moderate risk of thunderstorms. During the previous night I checked the convective maps for the following day and I was not impressed. Instability was rubbish with a CAPE of only 125. This value would completely put me off thinking about any photographic trips to the country. However the situation changed the following day with the latest GFS data showing much stronger instability at over 660 CAPE. Now that was more like it. There was also enough vertical wind shear to avoid updraught/downdraught overlap combined with a low risk of tornado development. I had been up early checking the situation out and things did look good. 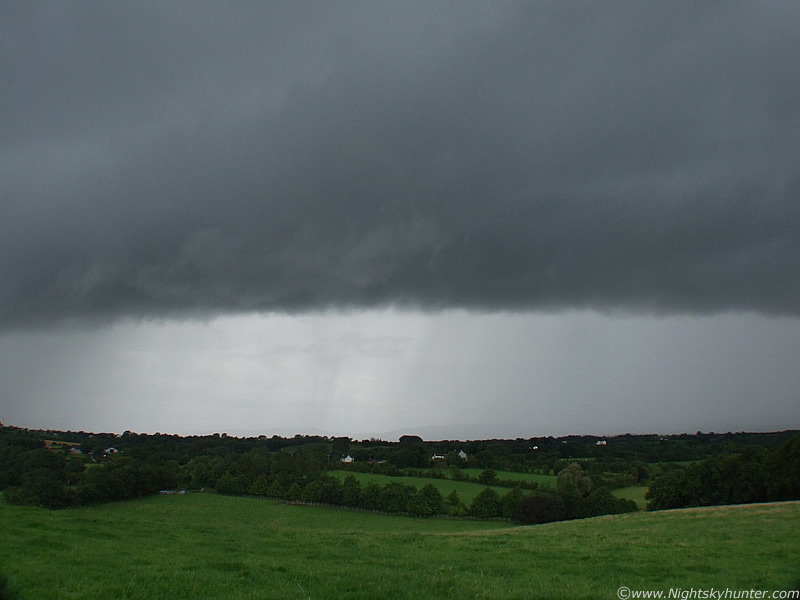 Radar showed some serious activity in SW Ireland with thunderstorms breaking out. This strong convection was moving at a decent rate to the NE up the W spine of Ireland but it would take a while to get here. By clicking on the latest radar images I could see how much the storms had moved over a 30 min period and made a rough estimate that they should arrive near my location by late afternoon, but more likely early evening when solar heating was at its strongest. So it was just a matter of waiting. It's at times like these that I forget just how amazing the internet is. From my own desktop I can tell where the storms are located, what direction they are moving, and at what speed. Also, which are producing lightning (sferics), its amazing really. The sky had been grey all day but by late afternoon blue breaks appeared in the cloud deck and the Sun went to work on the ground. When the mid level muck vanished I could see some pretty serious looking convection going up fast. Time for a quick brew and one last check of the radar. The latest update, which was still about 25 min's behind real time, showed a vertical line of storms moving swiftly near the N. Ireland border. These had multiple red and white radar echoes so they looked in good form. 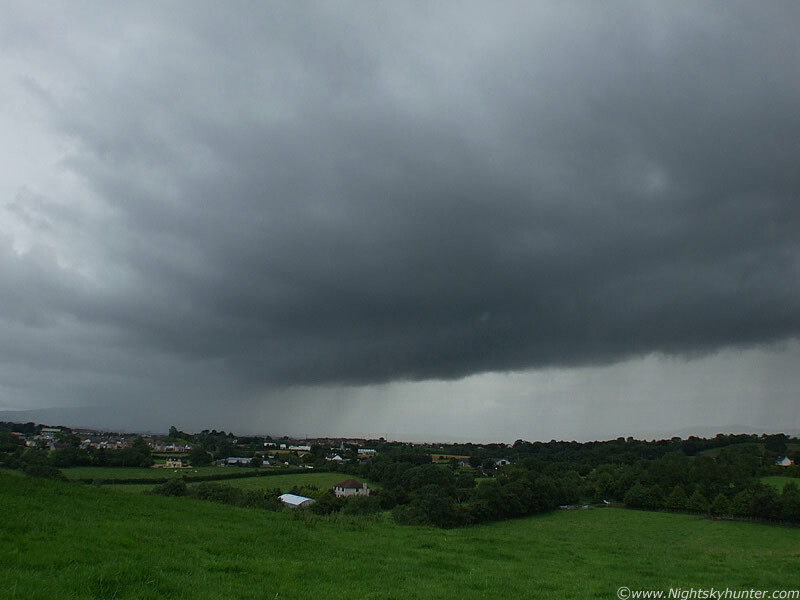 If these sharp showers could hold together has they moved over the cooler ground of the north then I might get lucky. It was time to get away from the computer and out under the sky. I went out on foot to my usual location deep in the countryside. The Sun was hot when it came out and the lines of convection to my S, SE and E were too tempting to ignore so I immediately began taking images and lost track of time. Big slow moving Cu towers fired up quickly and large cbs with rock hard anvils dominated the eastern sky line. These where far away and huge with low bases. 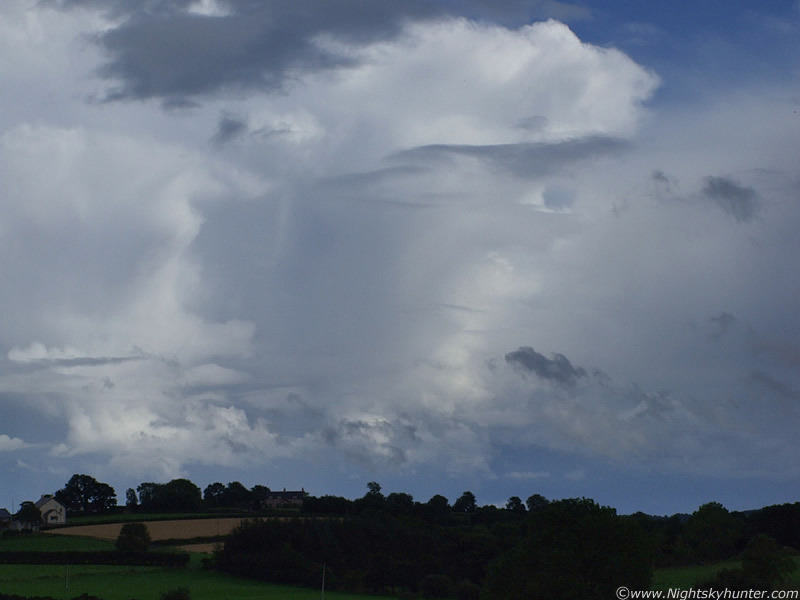 A nice mammatus display formed on the W side of the anvil as a bright white cluster with well formed bags. The atmosphere was pleasant and I could see a young Buzzard gliding on a local thermal. A farmer entered the same field I was in driving a quad with his son on back, I don't think he actually seen me, or else he didn't care. 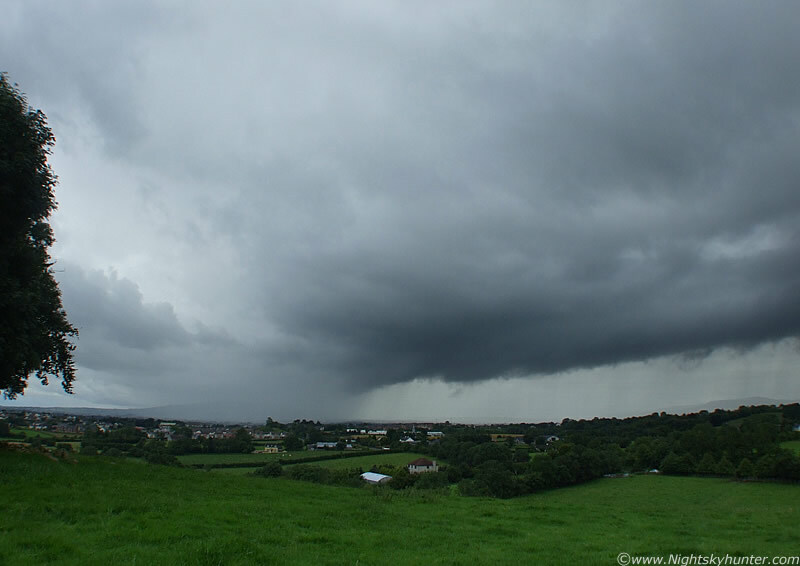 A little later more substantial convection was growing over the mountains producing rain and narrow shafts of hail. 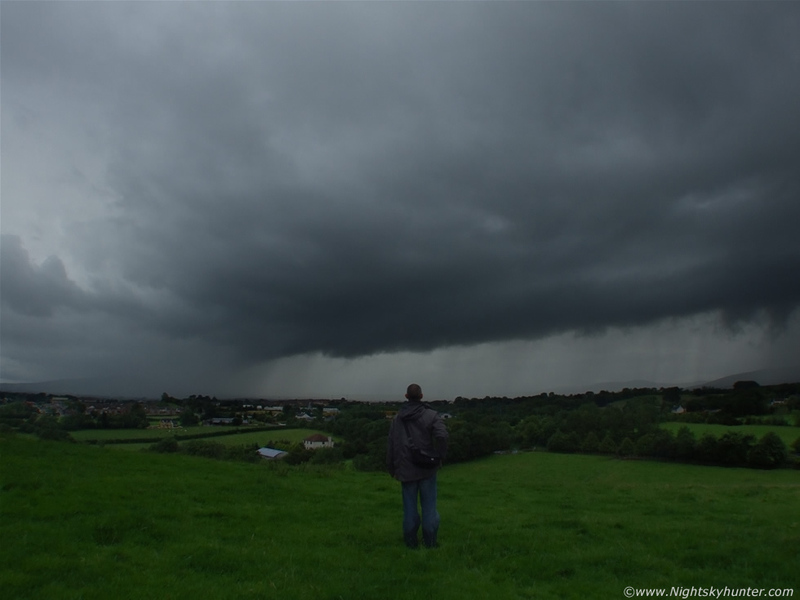 The SW sky kept getting darker and darker and this became the focus of the action which was about to come. Soon a messy mountain of convection arrived on the scene. It was huge!. I have too many images taken from this day to put up here which is a pity because this system alone turned into a nice structure itself with nice precip core, curved gust front, and streamlined updraught and anvil with mammatus to the L. Behind this structure I could see something moving in over the tree line. It looked very serious and organized but my view from here was not a good one. I decided to head further W to a higher vantage point. My instincts told me to get a move on so I set out across the fields, climbed barbed wire fences scaring a few cows in the process, then I ran up hill through a small but dense forest and jumped into another field, this time scaring a herd of Rams. When I got around the edge of the forest and looked to the sky I saw a very impressive scene. Panning further to the W of the above shot showing outflow cloud in front of the approaching darkness. 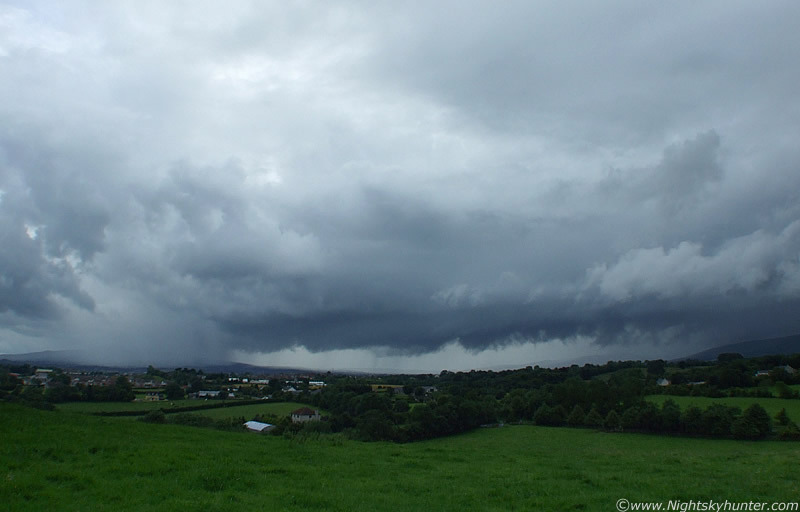 The first second my eye looked into the W I knew there was a storm forming over the Sperrin Mountains. A huge black Gust Front marking the leading outflow edge of the storm stretched across the entire skyline from S to N. The biggest outflow boundary I had ever seen. The leading edge was very dark and its underside was extremely low to the ground with an entire row of scary looking scud which seemed to scrap over the very mountains themselves. 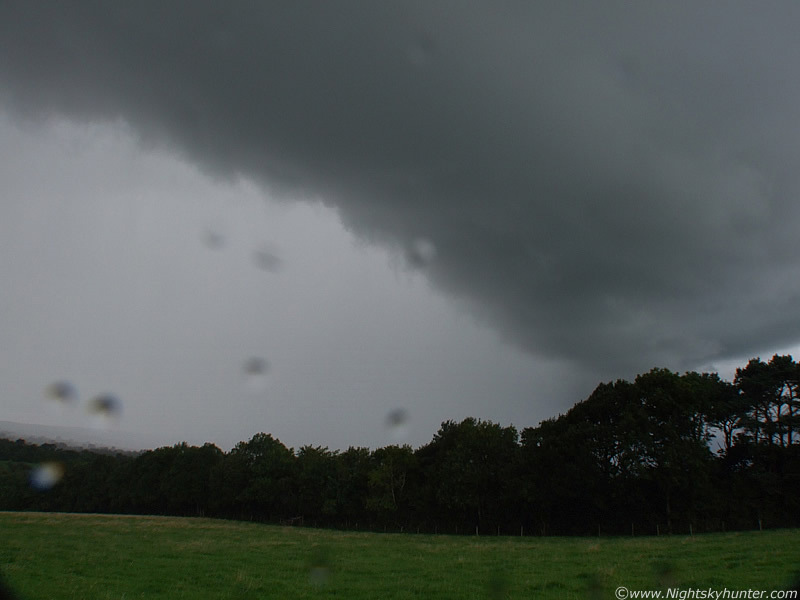 It was very dark there and a dense precipitation curtain hung below the Gust Front for the entire length. 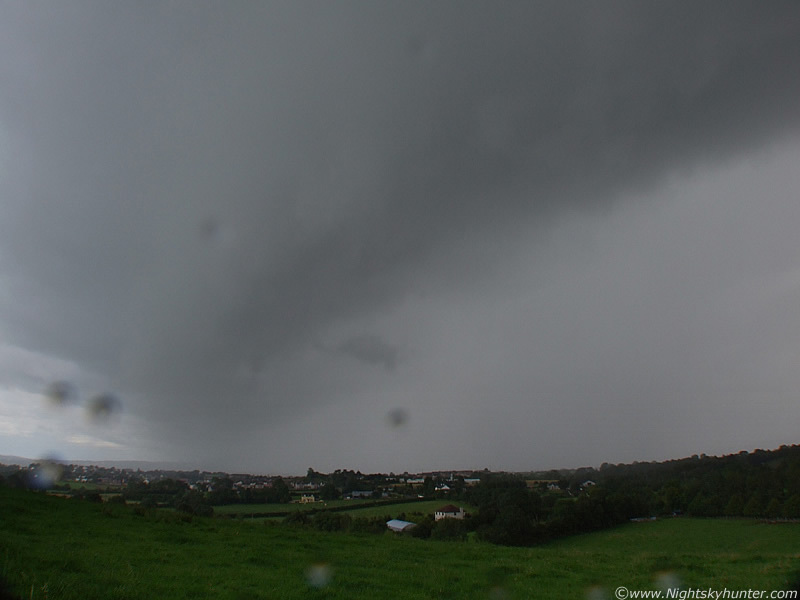 This is a super wide angle capture showing the S and mid section of the Shelf. Nasty looking scud 'teeth' hanging down. The N section still extends away outside of the frame to the R. No doubt dirt and dust over the Sperrins is being kicked up by the outflow. S section of the Shelf using the zoom lens. Yip, that is nasty! The S side was remarkable where it met Slieve Gallion Mountain. This image shows this very S end of the system. 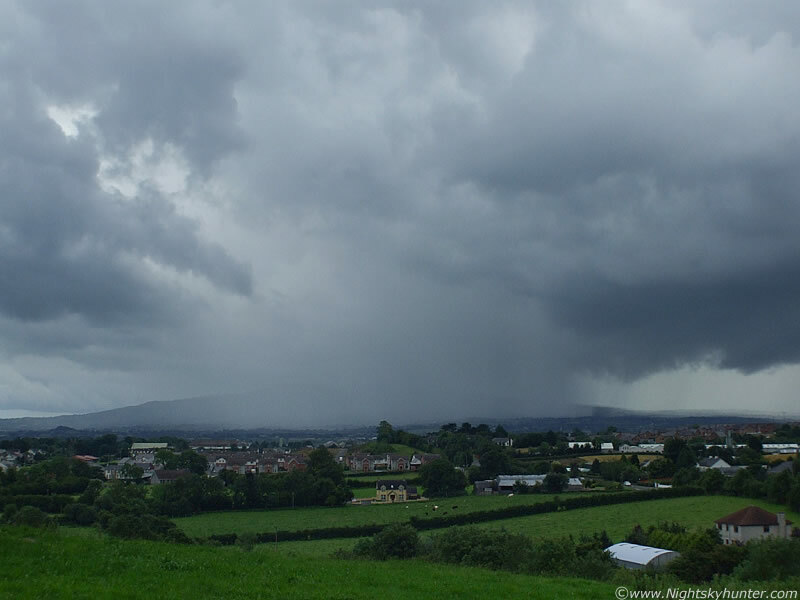 Torrential rain is hitting Slieve Gallion, that looks spectacular. The top of the mountain cannot be seen. The R of that dense preip core is the very end of the Gust Front. 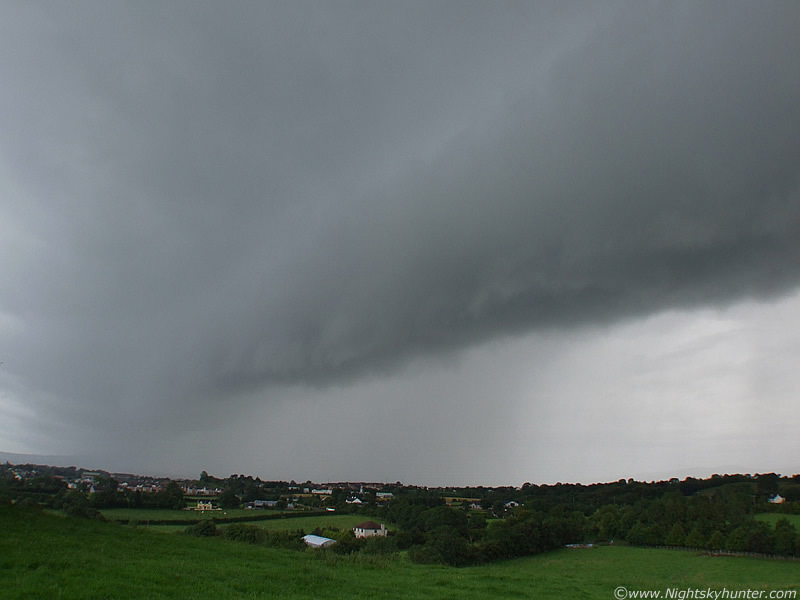 The image spans S to SW and it was heading straight for me. 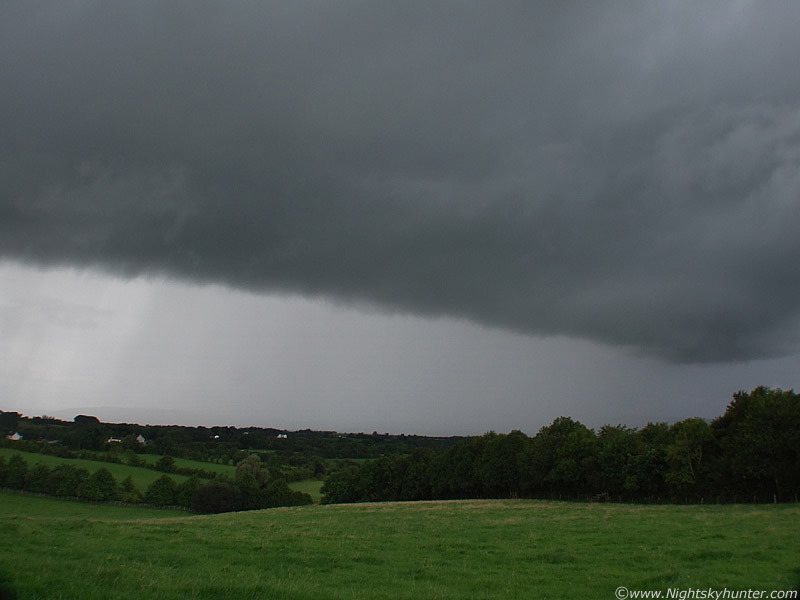 I was lucky to be on such a high position overlooking the country to catch this dramatic scene. 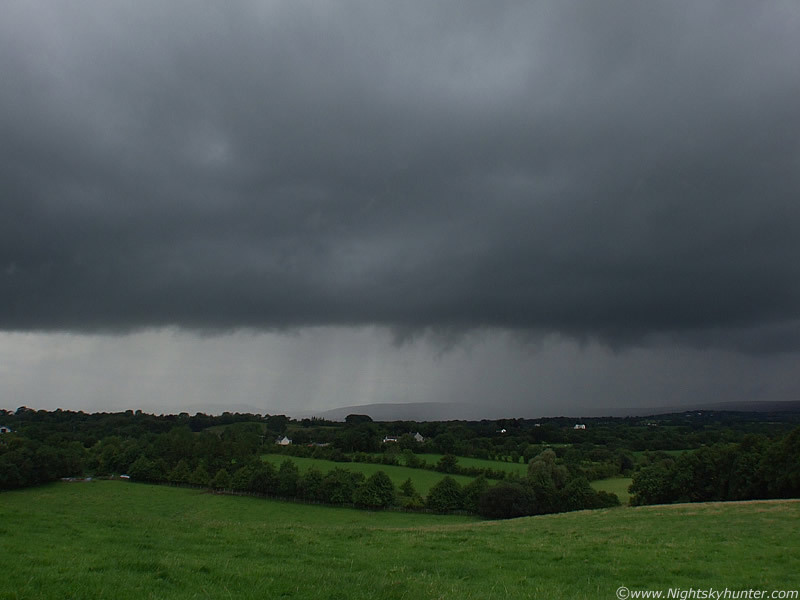 Behind the precip curtains are the S Sperrin mountains. 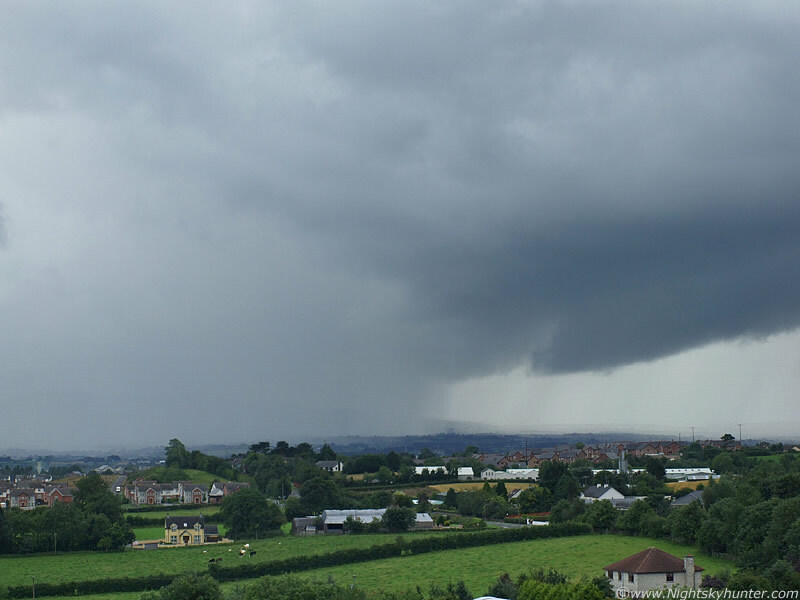 To the L is Slieve Gallion now blocked by the precip core. Super wide angle image showing the S to W sky sector. Gust Front is more organized now and forming a long dark Shelf. The other half of this monster is located out of frame to the far R in the N. This looked fully capable of throwing out a few sparks at any moment. I couldn't resist standing in for a shot. Used the 10 sec timer and just hoped for the best. It's difficult to tell how far away you should be from the camera for one of these shots but I think I was placed well here. If anything it shows a sense of scale. I thought I might as well go for a self portrait because soon there would be no time at all when the outflow hit me. You can see how wet the bottom of my jeans are from my efforts to get here before this thing moved in too close. You can see some of the low level scud to the R. This was dancing all over the place from the cool air pushing ahead of the storm. From a distance it's easy to think these Shelf Clouds look peaceful but they are far from it. That rain curtain underneath, and the dramatic moving scud, are two visual cues that the weather is going to get nasty soon. This is what I love about a good Shelf Cloud. The anticipation and excitement of watching them creep closer to you and not knowing exactly what's going to happen. Also, who knows what could be lurking behind that rain curtain!. There was no doubt that this was already the most dramatic example I have seen to date but it was about to get even better. The Shelf is alot lower to the ground than it looks. It was practically hugging the hills when I first seen it when the whole sky was dark. The land slopes down between the Sperrins and my location so it seems higher than it really is. If I had been on top of the mountains that scud would have passed through me. Another shot, only this one was taken to show what the scene was like with the naked eye, these were really beefy dark storm clouds. Getting closer. Even writing this now I can feel the tension and excitement mounting as this got closer. I knew what was coming so I zipped up my jacket and made sure my lens covers etc where back in their case. I needed to be ready to take cover. The clock was ticking and the photographic window was closing fast so I continued taking images and video clips. Good job I brought the tripod with me. Shutter is open longer because the sky was very dark now. The Shelf along the leading edge was very dark indeed but I needed to use a longer exposure to pick up the rain curtain. The magnitude of the rain curtain was near enough exactly what it looked like with the naked eye except the detail was more rich which fine striation lines running vertically down the curtain. Looking W as danger looms. Now the Shelf took on incredible form as it became an extremely well defined linear structure of high vertical extent and good depth. It looked very solid looking to. This was a good sign. 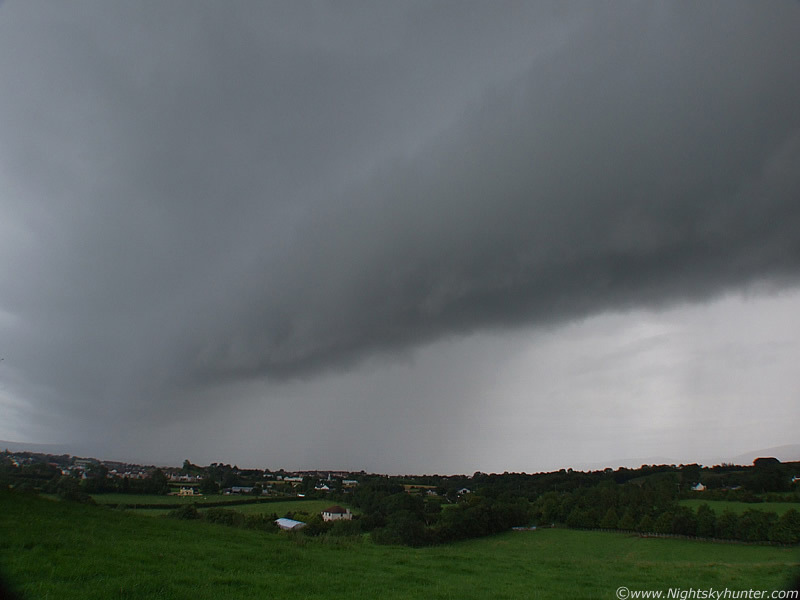 The Shelf is holding itself together very well and held close to the precip core. The chances of getting sparks were good. For a sense of scale pick out a window in those distant houses and visualize the size of a person, then compare to the above!. 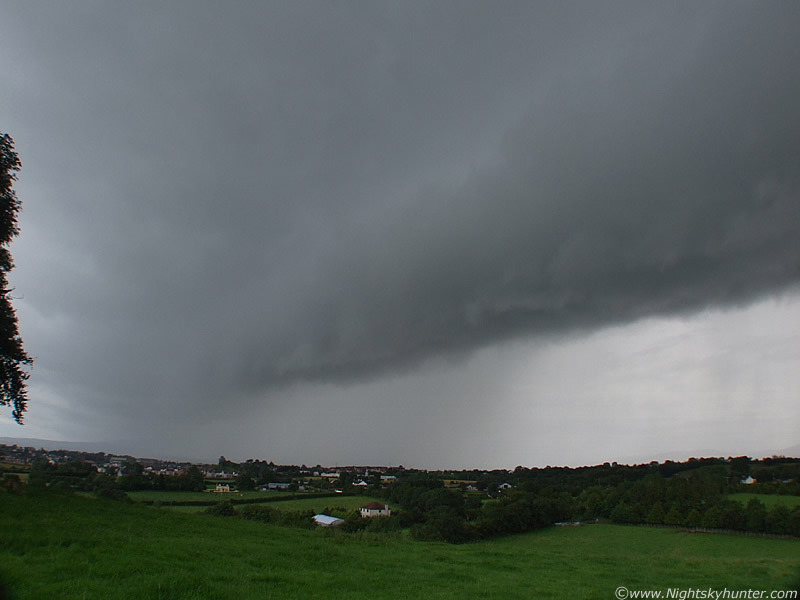 Maghera is getting pounded now. Many cars along the Coleraine Road would have seen this thing and no doubt remarked about it to their passengers. The cars had their lights on. I was amazed by the sight of this Shelf. I briefly wondered if there where other storm photographers out there who were also watching this. A Gust Front is the leading edge of cool air rushing down and out from a thunderstorm. 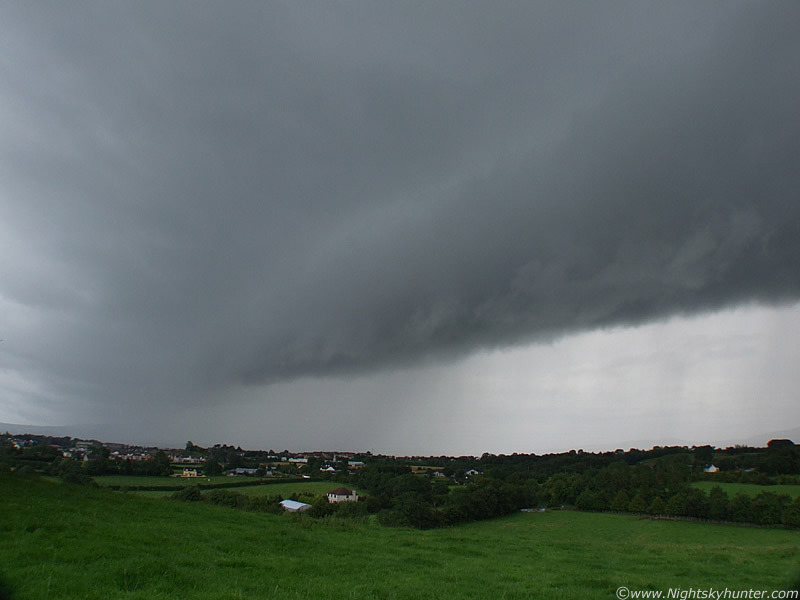 There are two main reasons why the air flows out of some thunderstorms so rapidly. The primary reason is the presence of relatively dry (low humidity) air in the lower atmosphere. This dry air causes some of the rain falling through it to evaporate, which cools the air. Since cool air sinks (just as warm air rises), this causes a down-rush of air that spreads out at the ground. The edge of this rapidly spreading cool pool of air is the Gust Front. The second reason is that the falling precipitation produces a drag on the air, forcing it downward. If the wind following the Gust Front is intense and damaging, the windstorm is known as a down burst. So in a nut shell, think of a Gust Front has a vacuum cleaner blowing air out instead of in. A quick turn and capture looking W.
Looking NW at the far end. I really should trying making a panorama using the above two images. Closer still, with camera adjusted to the L and Shelf taking up more of the frame. To the L is the edge of the forest I ran through to get to this position. I would soon be running back there for cover!. Shelf has taken on a pronounced curvature along the leading lip. Quickly altered the shutter speed again as the sky darkened further. I was taking images non stop now. The lens is almost wide open with a true field of at least 120 degrees so this is closer and bigger than it appears on the image. There's a strange sensation of time when one of these guys head straight for you. From a distance they seem slow and relaxed, but once near you they seem to really close the gap in a subtle yet rapid fashion. The distant (S) end of the Shelf is now curving strongly. This was happening to both ends of the structure. At this moment in time things were relatively calm and I was still dry. The cool outflow air hits me. At first it's a subtle breeze then it suddenly whacks me with stronger force. The first rain drops blown outward from the Shelf are now hitting the lens and my face. The Shelf is curved in spectacular fashion at both ends now. I quickly spin the camera around on its mount 180 degrees to the R and face directly N at the other end of the Shelf which now looks very menacing. Now it's covering ground very quickly. The leading edge was racing over those tree tops at a good pace. Rain is really starting to go for it now. Over she goes....I'm directly under the Shelf now. The trees are disturbed, the temp drops, darkness descends, then all hell breaks lose!. 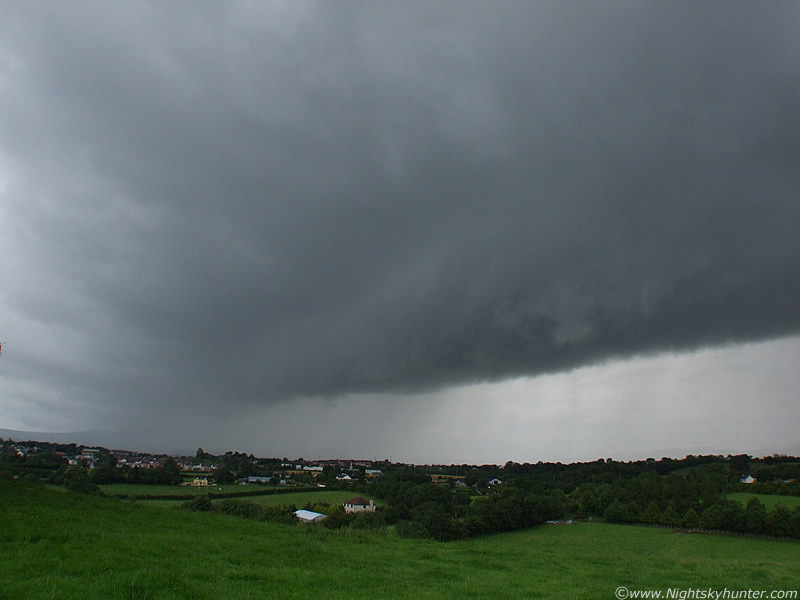 Within sec's the most phenomenal torrential rain begins, and when I say heavy, I mean heavy!. I grabbed the gear and ran over to the edge of the small forest to take cover under the trees which is not a great place to be but I had no choice. I sent John McConnell a text message to tell him about the monster Shelf which had now hit. He told me to be careful because he had seen one earlier which caused floods in his area. I told him that I was in a bad place and was worried about c-g lightning but by the looks of things this wasn't electrical. I had to keep wiping the screen of my phone dry to read his text replies. The rain was just crazy. Even under these trees I was still getting soaked to the skin. My camera couldn't take it anymore. As you can see I'm directly under the main precip curtain and because the cell was a slow mover it wasn't going to stop anytime soon. I got a call from home asking me if I wanted picked up because things were getting really bad over the entire area. I declined the offer because I wanted to experience the whole thing and besides, the rain was bound to stop soon, and when it did, I might just catch some cool mammatus behind it. That never happened, the rain got even heavier, 100% torrential like a monsoon. This was definitely red and white on radar. I noticed that the grass around me had turned to mud within min's and when I stood up I almost fell on my back twice. The camera was back in its case but even that was soaked through. I did dry to take video of the rain but it was impossible. The lens was a blur the very instant the lens cap was off, plus I was having trouble seeing anyway as my eyes were stinging. To the W there was no visibility. I had a feeling I was going to be here for a while. Suddenly a rapid fire bright flash lights up the sky from somewhere followed by a long duration angry roar of thunder. Oh dear. Actually, the words I spoke out loud were more graphic than that. The thunderstorm came to life then with it came the natural fear of getting hit. It's one thing hearing a thunderstorm from inside the comfort of your own home, but its a very different situation when you are out in it. The sickening punch of reality hits you smack in the face and you really begin to worry big time. With the exception of being on the top of Slieve Gallion leaning against the metal tower, this location was probably one of the worse local places I could be. I was on extremely high ground and under a line of trees. NOT good at all. I really needed to do something. I noted that I was standing under the tallest trees in the area so I had to make myself a less likely target. On the other side of the field was a line of thick bushes with substantial overhang, they would still provide cover and the lightning was less likely to hit that region compared to my current position. Well, it seemed logical to me at the time so I ran across the now swamped field and slid to a violent stop under the branches. I set the metal tripod far away from me incase it attracted lightning, caught my breath, and composed myself. More lightning lit the sky up in my blind spots, I didn't know where it was coming from which added to the confusion and panic. The thunder got even worse. It was actually quite threatening as it rumbled loudly for a long time. The flash and bang picked up in frequency so I thought I would try my luck with some more video. I tuned my camera on, the LCD screen turned white with flickering lines then died. Blast it anyway!, the rain had killed my camera. That put me in a bad mood because here I was doing the very thing which I enjoy and have no way of recording it. Then I remembered my mobile phone. The camera on it is rubbish but I had to try something. 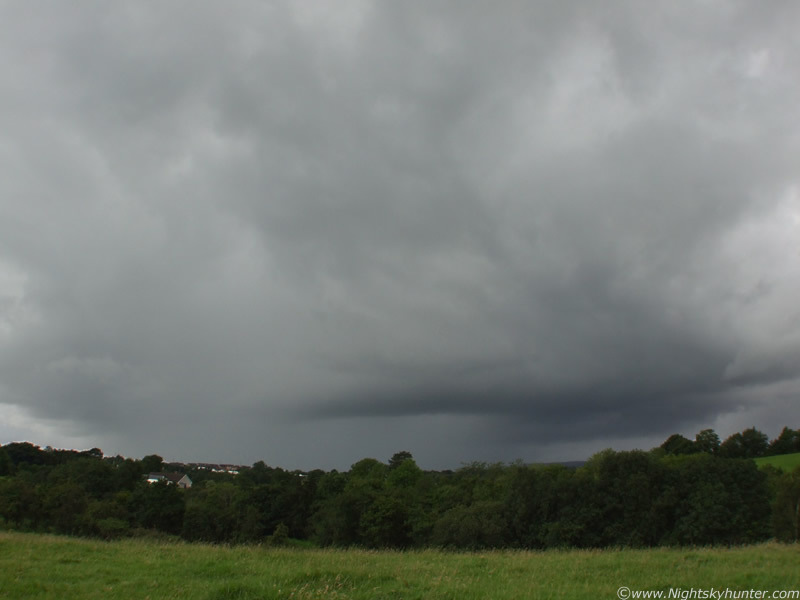 I managed to record the heavy rain and the sound of thunder so things were looking up. Through my rain stung eyes I could see directly underneath the Shelf. The best Whale's Mouth structure I have seen since the storms in 2007 was visible in dramatic fashion. The entire E dome of the sky was covered in that classic sculptured pattern. It was quite incredible. I managed an salvage this image from my mobile phone looking E at the rear of the Shelf. The image was taken under severe conditions but I will not post it here due to its poor quality. I estimated that I had been under this complete monsoon-like storm for half an hour and there was no sign of things easing. More bright flashes and nasty thunder. Everywhere I looked there was rain. The flashes seemed to ignite in the SW, W, and N. I also caught them in the corner of my eye and never seen what kind of lightning it was. I found out later they were c-gs, the deadly kind. Here's a youtube video clip of the approaching Shelf. This is the full original video. 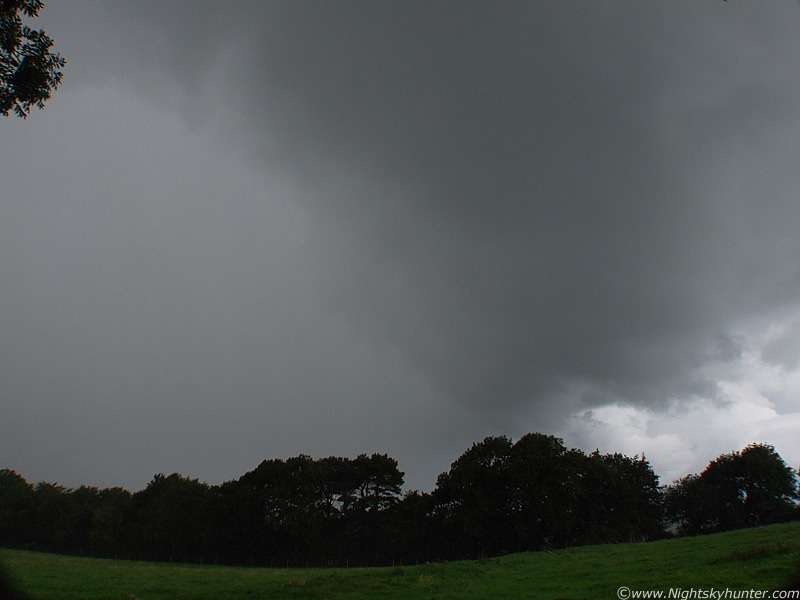 Meanwhile, I was still stuck under the bushes with t-storm and torrential rain aloft. My instincts told me that this wasn't going to stop and it was time to make my way home. I was going to send John one last message to give him an update then ring home and get out of there. My phone was dead, the rain had got to it to. So much for modern technology. My communications were down so I had no choice but to get out in the open and walk home through this bad storm. I mentally prepared myself, exited the bushes, and ran down several acres of strongly inclined field, I was slipping and sliding like an eejit and couldn't control my speed. There was no traction in the ground so I eventually stopped when I literally banged into the gate at the bottom of the field. I hopped over and landed in the Atlantic Ocean, or it least it felt like that. Both sides of the Coleraine Road where completely flooded. I have never seen it so bad in years. The main road and footpaths blended into one. A flash above me smartened my senses so I began the long run home. I ran through the flooded footpath, it felt like wading through a shallow river. Despite extreme effort my progress was slow as I was so heavy in these soaked clothes. Cars and trucks drove slowly through the flooded road unleashing huge wave crests of surface water over their dim looking head lights. This was extremely difficult physical exertion. I had a very strong feeling about getting home but I was beginning to wonder if I was going to get hit my lightning. I felt like I was doing an SAS selection course. I hoped that all those years of training I done in the past would help me out now. They did, I pulled out the mental barbells and focused on my destination. So if you where driving along the Coleraine Road on Monday evening and saw a nutter running through the flooded path with a tripod, then that was me. I made it home as more thunder broke the steady sound of the monsoon rain. I was completely soaked to the skin so I had to change out of my clothes, dry myself out, and get another layer on. I took apart the mobile and camera, wrapped them in a towel and set them inside my Sister's reptile tank. It's very warm in there so it would be a good place for the gear to dry out. I was more concerned about getting the images off the camera than anything else. Our Iguana, 'Speedy', wondered who the knew visitor was in his tank. 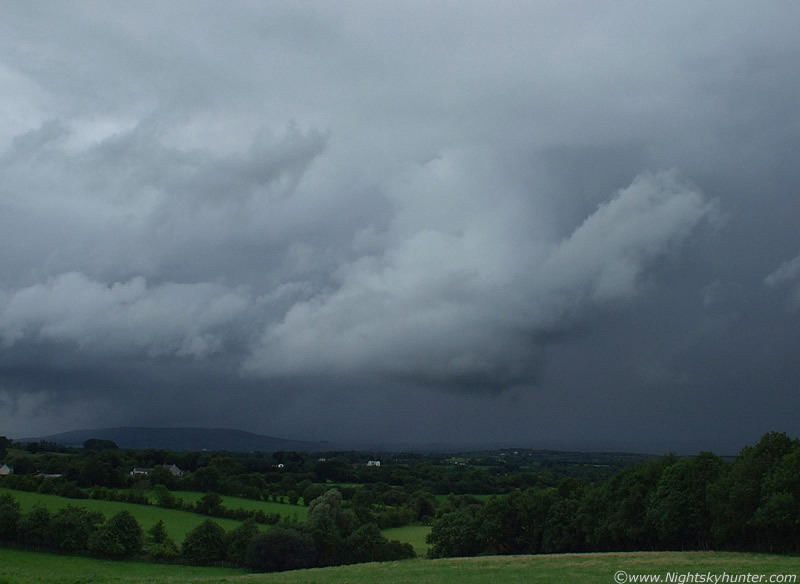 I felt handicapped by not having a camera because I noticed another storm approaching over Slieve Gallion so I found my old Fujifilm S5600 5.1MP camera then headed up the road and imaged the new storm. The core delivered more heavy rain so I went back home, again soaked to the skin. The rain never stopped at all. During the late evening I had to put my camera in the hot press to get rid of the damp. I managed to get the images and video off the card despite a flickering LCD screen. My mobile did not fare so good. It switched on OK but none of the buttons work. I can receive text messages but cannot read them. As I write this two days later the situation has not improved so I have to get a new phone. This thunderstorm has cost me a good mobile!. The Met Office issued a severe weather warning and they were correct to do so. That night I heard the most incredible rainfall I can remember in years. It was so loud and violent that I couldn't sleep. I was just sitting there in darkness at 04.00 BST listening to the rain on the roof. The last terrible rain event was during the big storm in early January. The rain from that low pressure system was been driven by continuous gale force, and gusts of storm force winds, but with this rain there was no wind at all, it was actually calm but the rain was much louder. It built up to extreme intensity until I thought it couldn't possibly get heavier. It made a continuous low rumbling sound like thunder, but lasting for hours. It was quite scary I have to say. The next day my Sister said the same thing, she never seen or heard anything like that before. The next evening I was heading into Magherafelt but I wanted to stop and have a look at the Moyola River. It was amazing. The river was in a serious flood, I ran out for a quick look but had to retreat because I had to be in town for a particular time. On the way home later I did get a proper look. The flood water had receded a great deal but it was still impressive. The fields surrounding the river were completely flooded. A small crowd of onlookers had gathered on the stone bridge to watch the scene. I got chatting with a local fisherman and he told me the flood first thing this morning was incredible. The river burst its banks and nearly went over the top of the fence posts, that is, the fence posts in the adjacent field on very high ground far beyond the river bank. He pointed out the water level and I was amazed. What a frightening sight that must have been. He told me it was the worst he had seen it in years. On the last occasion he seen cows floating down the river. They all drowned. You would have no chance if you fell into the flooded Moyola. Maghera even made it onto the news that day as flooded roads caused problems for drivers. In Moira people had to be rescued from their cars and I even heard about a group of campers rescued. I couldn't believe it, who would be camping out in a tent near a river in severe weather like that?. They are lucky to alive. 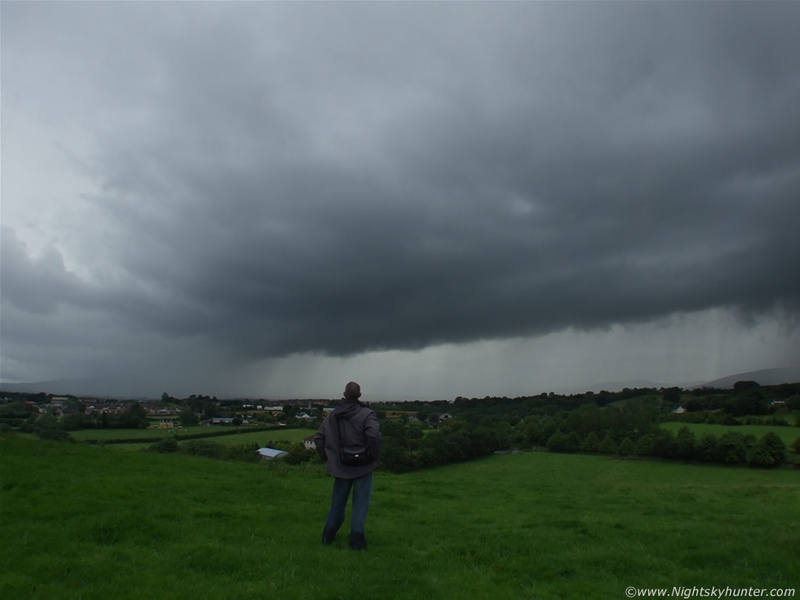 So, it was a very exciting 24 hours with the highlight being that mega Shelf Cloud and thunderstorm. I found out that my friend John had seen this very same Shelf later from Maghaberry when it crept E across the country. It was really wicked looking and low to the ground with a twisted profile. He told me he never seen anything like it in 25 years. I hear there is more to come!. Thanks for reading.